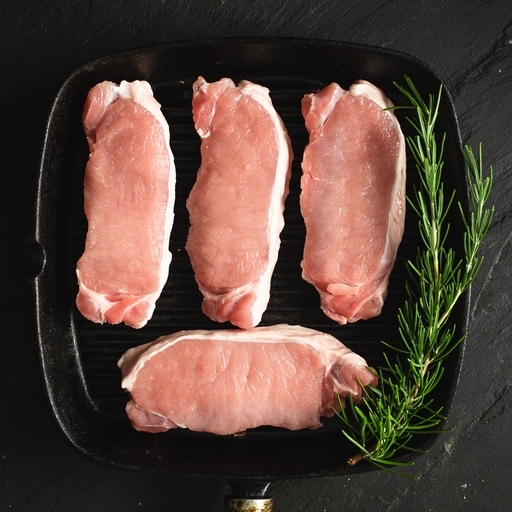 Full-flavoured organic pork loin steaks. These are prime, lean pork chops – just juicy meat, with no bone. As good quick-fried as they are oven-baked. They pair well with sweet-and-spicy Asian flavours, and with the more traditional tastes of cabbage, apple sauce and mustard. Approximately 4 pork loin steaks per pack. Season generously on all sides. Pan fry in a very hot, oiled frying pan for 2-3 mins a side, until just cooked through. Try and get as much colour on them as you can; it all adds to the flavour. Leave to rest somewhere warm for 5 mins before serving.